In April of 2017, I wrote a three-part post on my son Justin’s Continental FC team and their great experience at Iber Cup USA (IberCup Part 1, Part 2, and Part 3). So much has changed since then, and now that we’re into September and the youth soccer season is well underway, I’ve done a little reflecting on all that change for my son and our family, and what I’ve learned along the way. This summer, as my son’s first season with his new club kicked off, I was talking about his soccer background with one of the other parents, and came to the realization that he’s now played for four different clubs in the last four years (before turning 10). Sounds a little crazy, I know, but I promise that each move was logical and well thought out along the way. Justin, at an early age, had a high level of natural ability, but even more so had this deep rooted interest in the game right from the start. Even at one and a half years old that first Union season, he would sit intently in the stands at Union games for 90 minutes plus. I remember him running around at camps and practices at about age 4 in a full Leighton Baines Everton kit (socks included), just like all the other kids. All in, this was one of my greatest parenting achievements – seeing him embrace a true love of soccer. Aston Youth Soccer Association – Save for a peewee year at a neighboring town’s league, AYSA is where it began. Having the opportunity to be a head coach and assistant coach for Justin’s teams across three seasons left me with some unforgettable memories. Continental FC – Supplemental training with some other talented Philadelphia area players and an existing relationship with the coach led to an opportunity to join CFC. This particular age group assembled a large pool of players from a wide radius, and presented a wide variety of training opportunities and resources to really build something special. Watching these teams play was a joy, and this is the season where the Iber Cup trip (Dallas) and the Super Copa trip (Chicago) happened. 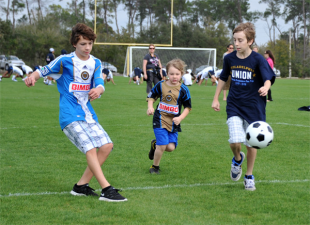 Philadelphia Union Junior Academy – The Junior Academy, or pre-academy program kicked off in the 2017/2018 season, and I’d estimate that about 30 players from Justin’s CFC teams made the move. I remember the excitement on his face when he first saw the invitation video they sent, with player appearances, welcoming him to the Union family. Pretty surreal at the time. Much like his Continental experience, the schedule and commutes were pretty intense, but the training experience and level of play was of great quality. I think he’ll look back on this time fondly. FC Brandywine – The new club. More on this below! Earlier this year, my son made a decision to switch to our local club, to play with his friends (and probably to spend a bit less time in the car too). A few months in now, the decision looks to be the right one for Justin and our family. He’s happy, having fun, playing well, and spending much less time in the car. Was it easy? Not at all. I was impressed by the Union’s program, and they had very clearly laid out how they would build upon it in the 2018-2019 season. With some help from my wife though, I became more and more aware that a change is what he really needed for the upcoming season. I’m pretty laid back by nature. I’m not up all night plotting how to build the ultimate soccer machine at (now) age 10. My main objectives are to help give my kids as many opportunities as possible, then kick back and watch them enjoy the ride and hopefully grow into good teammates, leaders, and people. Awareness is key – Even in the absence of direct pressure, I became aware that my son had this overwhelming fear of disappointing me with decisions like this most recent club change. I likely contributed to that in subtle, unintentional ways. Spend less time analyzing plays, hypothesizing over where your son or daughter may fall on the depth chart, and spend more time letting he or she know how much you enjoy watching them play. Simple, yet effective. I tell both of my kids every day how proud I am of them, both on and off the field. Fun comes first – The quality of play, coaching, teammates, and facilities at some of these clubs is fantastic. We’re grateful to have had such excellent opportunities for development. But don’t lose track of fun. Something shifted for Justin early this year, and ignoring that for long would have been a significant mistake. As a coach, what makes me feel most successful is when a season ends, that the players I worked with can’t wait for the next opportunity to continue playing. Nurturing a continued love of the game (I want him to still be playing men’s league soccer in 30 years) is the most important thing to attend to, no matter which jersey he’s wearing (though hopefully, we stay put for a while). Thanks, Scott for the update. Bringing up kids is a tricky thing. Not so sure about the fun thing the way you describe it. One of my sons sat on the bench a lot for a strong team and did not have much fun. But after being Captain in HS and College, and making a team in Hong Kong, where he is currently for his semester abroad the hard work all paid off. Kids need to learn that hard work is not always fun but that it ultimately can result in a lot more fun. Thanks Guido. There’s plenty more detail I didn’t add, partly for brevity, and partly to keep a few things private, but I’ll try and clarify the “fun” thing a bit. I’m all for challenging kids. His particular CFC team trained or played 5-6 days per week most of the calendar year. The Union Jr academy program was a little bit lighter on the schedule, but still a very real commitment and challenge. Both were great experiences that made him a smarter, tougher, better player. What we saw towards the end was that something shifted for him though, and we may never know exactly why. He really didn’t want to go to training the final month or two of last season, and it was much deeper than wanting to stay home and play on his iPad. I agree that hard work pays off, and that things aren’t always fun all the time, and I’ll admit that i did very much want him to stay where he was at first. But I realized it’s very important to really listen to your kids and recognize what’s going on for them. I didn’t want him to lose the love for the game, or burn out early trying to make other people happy. I hope he plays in HS and college like your son did. I hope he plays men’s league soccer when he’s my age… coaches kids one day. He’s really happy playing right now, better able to play baseball and basketball at a pretty competitive level again, and doing well. I guess my main point is that there’s more than one path, and I’m more okay now with changing paths than I once was. Thanks for reading – much appreciated! Great read Scott – and very welcome advise. I enjoyed reading your article. We’re fortunate to live close to YSC, which allows our son to easily do both the Union Jrs and FC Europa (the kid can play all day, every day). It’s been an fun experience. As an aside, I believe you and my wife are both Marple Newtown grads and know each other quite well from middle school/high school days. Thanks Walt! I think our sons overlapped a little bit in the union Jr academy program. And yes, your wife and I do go back a ways to the old Paxon Hollow and MNHS days! Agreed it’s a very difficult path to navigate. We were lucky in that both of our kids liked to play, but knew it wasn’t going past high school except for fun. A good friend of mine told me this story. He was the quarterback at University of Illinois a long time ago. There was this highly recruited player from Chicago that had a straight path to the NFL. After the first week of practice he walked in to talk to my friend to tell him he was quitting. He had been playing intensively since he was a young boy and the joy of playing football was gone. I hope that my kids never lose the joy.